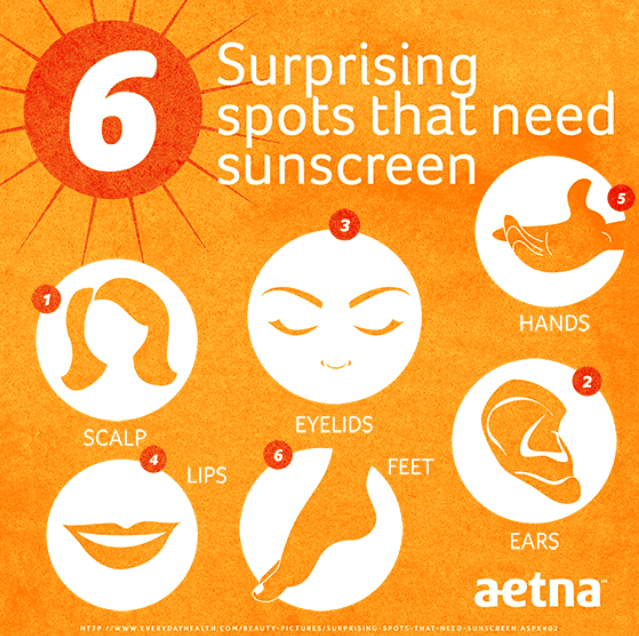 Now that summer has hit, it’s time to up that sunscreen usage! Since I’m so fair, I use sunscreen daily…even in the winter, just as a precaution. But now that the sun is in full force….I’m pretty much bathing in it! Here’s a couple sunscreen tips from yours truly. The 6 spots listed above are actually some of the most sensitive! Now spraying your scalp and your eyelids may seem weird….but think of how horrible that sunburn would be! Always be preventive. 3) Spray it, don’t smother it!! I’ve always been one to like spraying my sunscreen rather than using lotion. It’s easier to get optimal coverage from the spray than it is lotion….and you don’t wanna ask some random person to make sure your back is lathered in lotion. Just because your sunscreen says it’s 50 SPF doesn’t mean you only apply once. I apply every 30 minutes, just to be safe! Remember, your skin is the largest organ of your body. Cherish it. Take care of it. Love it. Leave a comment below and tell me: What’s your favorite organic sunscreen? And don’t forget to subscribe!